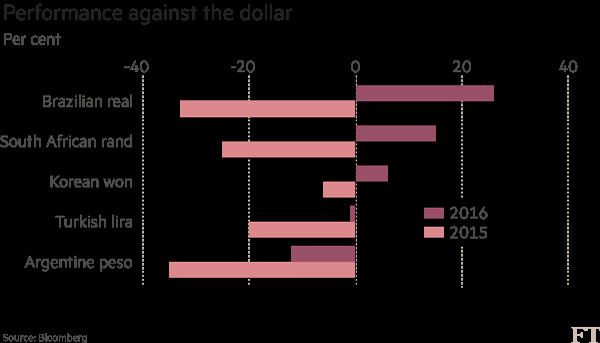 Emerging market currencies are benefiting from a “Goldilocks” global economy to rebound to their highest levels against the US dollar in a year. JPMorgan’s index of emerging market currencies has climbed 5.8 per cent so far in 2016, driven by the Brazilian real and South African rand, as developing economies reap the rewards of stable global growth, led by the US, without the imminent threat of rising interest rates. The UK’s decision to leave the EU and the Bank of England’s subsequent interest rate cut and asset buying have provided a further boost to emerging markets, increasing demand for riskier investments with higher returns as yields in developed markets fall to record lows. Credit analysts at Rabobank describe the gradual recovery of the US economy combined with external headwinds that have prevented the Federal Reserve from raising interest rates as a “Goldilocks scenario”, adding that in such an environment demand for risky assets was likely to continue to rise. South Africa’s rand has appreciated 14.8 per cent against the US dollar this year, helped by a rising gold price and greater risk appetite, while Brazil’s real has rallied to its highest level against the dollar for more than a year amid optimism that interim president Michel Temer can curb the country’s budget deficit. 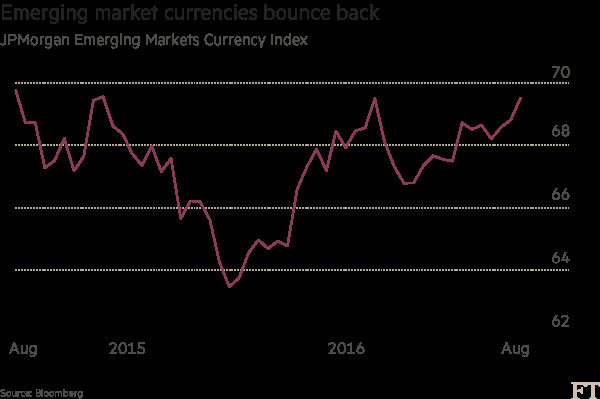 The performance of emerging market currencies marks a reversal from last year, when the US dollar’s appreciation, falling oil prices and concerns about Chinese growth led international investors to recoil from riskier assets. “Over the past five years, conditions for emerging markets have been tough,” said Dean Newman, head of emerging markets equity at Invesco Perpetual, although he added that factors such as favourable demographics, urbanisation and a growing middle class had remained favourable. Now, the environment was more benevolent, said Devan Kaloo, head of global emerging markets at Aberdeen Asset Management. Although the US has reported better than expected jobs data, policymakers have been keen to stress they are in no rush to raise interest rates. “Barring any shocks, ‘lower-for-longer’ US rates should help support EM,” he said.